The QX4 is the ultimate back yard machine… This new Swim Spa is really three spas in one… a powerful 4 jet waterway workout machine and a 48 Hydro-Jet 5 seat Therapy Spa complete with the exclusive Sunbelt Wave Machine ™. These two zones are separated by a clear removable wall that allows both zones to be used at the same time. 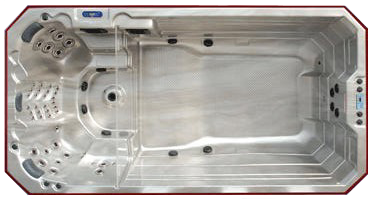 Each zone is complete with its own perfect temperature and water jet settings. Remove the wall and this spa is converted into the perfect family spa that is so big you can even invite the neighbors.